This firefighter rescued a woman during the Boston marathon bombing. Now they're getting hitched. Meet Boston couple Roseann Sdoia and Mike Materia. If they look impressive, that's because they are. Much like Rihanna and whoever that song is about, these two found love in a hopeless place. 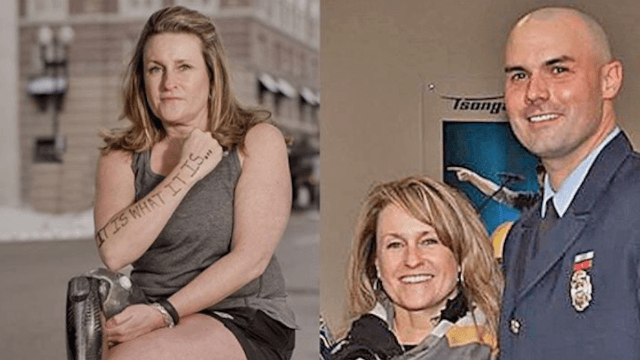 Sdoia, 48, was injured in the Boston Marathon bombing back in April 2013 and needed to have her leg amputated. When she was in the hospital recovering, her mom spotted a cute fireman nearby (moms are good at that). “In the hospital, my mom tried to set me up with him,” Sdoia, 48, told the “She was like, ‘Oh, did you see that firefighter? He’s so cute.’ And I was like, ‘Mom, I just got blown up.’"
When the bombs went off near the marathon finish line that day, Sdoia had been a spectator and was injured in the blast. A firefighter rushed to attend to her and escorted her to the hospital. “I asked him if I was going to die. And he told me that I was going to be OK, that I only had a flesh wound,” she said. As you might've guessed, that firefighter turned out to be #hospitalbae aka Mike Materia. He showed up at the hospital a few days later to visit her, and they started dating a few months later, the Times reports. He proposed in December and they're planning to get married in the fall. But that's not all! Yesterday, the couple raced up the 1,576 stairs of the Empire State Building as part of a fundraiser for the Challenged Athletes Foundation, which has played a huge role in Sdoia's recovery. I've heard marriage is hard. But I can't imagine it's harder than climbing 86 floors with a prosthetic leg. I have a pretty good feeling these two are going to go the distance.